Celebrity ambassadors and animal welfare experts joined U.S. Representatives Vern Buchanan (R-FL) and Earl Blumenauer (D-OR), co-chairs of the Congressional Animal Protection Caucus, on Capitol Hill yesterday to discuss the Safeguard American Food Exports (SAFE) Act. Introduced by Rep. Buchanan in January, the SAFE Act would permanently ban horse slaughter for human consumption in the U.S. and prohibit the transport of American horses abroad for that purpose. Representatives Jan Schakowsky (D-IL) and Ed Royce (R-CA), lead cosponsors of the SAFE Act, also spoke at the briefing, which was co-hosted by the ASPCA, the Animal Welfare Institute and the Humane Society Legislative Fund. The event featured guest speakers including Huw Collins, an actor on the television show Pretty Little Liars and son-in-law of U.S. Senator Jeanne Shaheen (D-NH), and Bonnie-Jill Laflin, a sportscaster for Fox Sports/BBC. 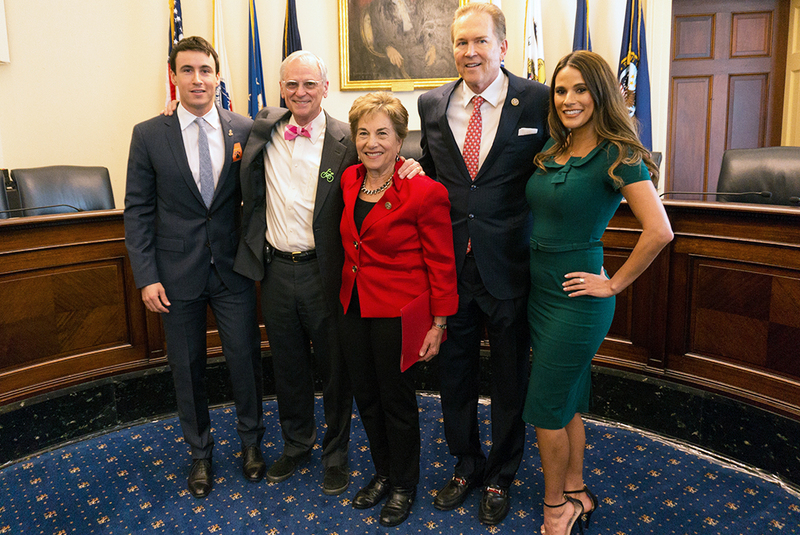 Huw Collins, Rep. Blumenauer, Rep. Schakowsky, Rep. Buchanan, Bonnie-Jill Laflin. 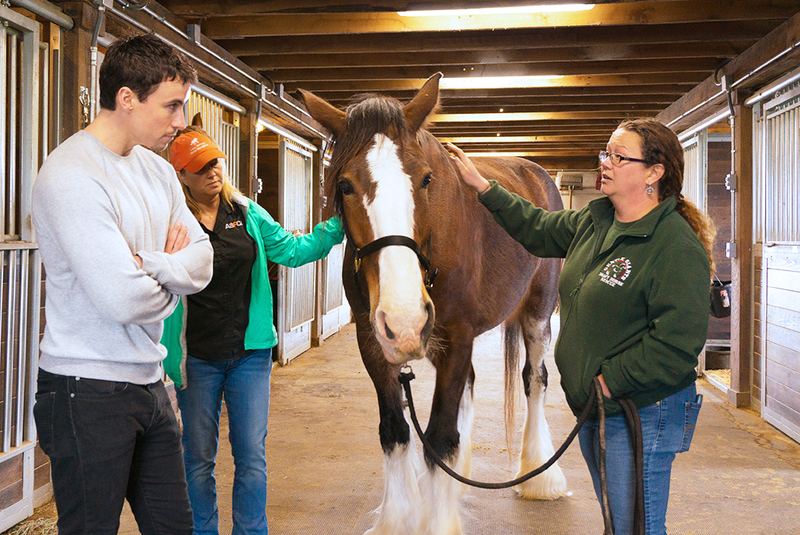 Prior to the D.C. briefing, Huw joined the ASPCA at Gentle Giants Draft Horse Rescue in Mount Airy, Maryland, in honor of ASPCA Help a Horse Day to learn more about vulnerable horses and the people, organizations and communities dedicated to protecting them from cruelty. Huw Collins and Nancy Perry (ASPCA SVP, Government Relations) with Gentle Giants president and founder Christine Hajek. ASPCA Help a Horse Day is celebrated annually on April 26 to raise awareness about the year-round, life-saving work done by equine rescues and sanctuaries to care for horses in need and keep them from slaughter. Eighty percent of Americans oppose the slaughter of horses for human consumption, but more than 100,000 horses are still being shipped to Canada and Mexico each year to be slaughtered for their meat. You can help end this horror for good: Urge Congress to pass the SAFE Act by signing on as a Citizen Cosponsor. 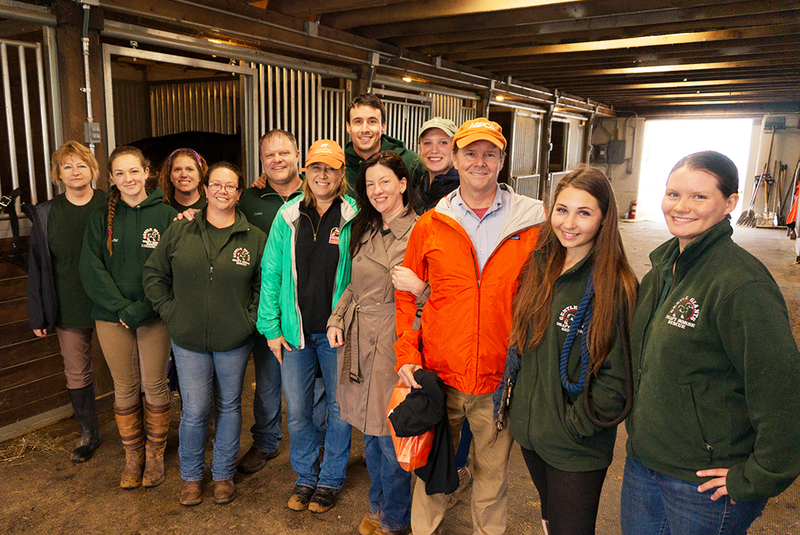 Gentle Giants staff and volunteers with Nancy Perry, Huw Collins, and ASPCA VP of Federal Affairs Richard Patch (orange jacket).